The Suite Spot ™ combines all that’s appealing, fun, social and comfortable about traditional bowling into a unique attraction, helping you grow your business, drive more revenue, and take your group and party business to new heights of profitability. The Suite Spot™ is ideal for attracting for groups and party business—making it the perfect addition to your facility. The Suite Spot™ is an industry-first solution that brings all the benefits of QubicaAMF’s expertise in bowling innovation to the larger entertainment world. Combining next-gen features of our hugely popular Highway 66 mini-bowling solution with Harmony, the industry’s first reconfigurable furniture line, The Suite Spot will send your VIP, family, group event, corporate and birthday party business soaring—and leave you celebrating. Most attractions are designed to appeal to one type of customer. It’s hard finding an attraction exciting enough to bring in new business while integrating seamlessly into your facility You want to grow your group event and party business. 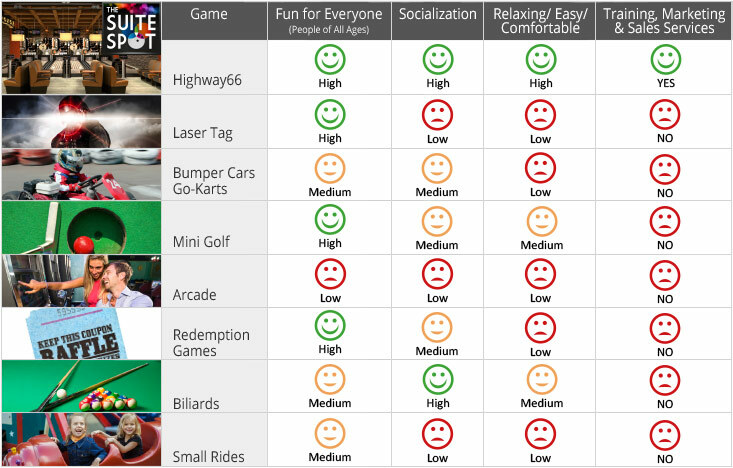 But so many attractions are aimed at individual players, and don’t offer a venue for socializing while enjoying the activity. How powerful would it be if you could combine these elements in to a single, thrilling attraction sure to keep customers coming in—and coming back time and time again? Compare and you see The Suite Spot™ is your best choice by far. Fill all fields to request more informations. DEAL 2018, the largest amusement and leisure trade show in the world outside of America. EAG International 2016, The Amusement and Leisure show in London is opening today!